Ketchum is marking its 90th anniversary today, kicking off a 90-day period of pro bono PR service to non-profit organizations around the world. The firm, which claims to be the longest tenured PR operation in the world, was founded on May 22, 1923 by George Ketchum and became Ketchum, MacLeod & Grove, handling PR, advertising and fundraising. Its first PR work was focued on Natural Gas Companies and People's Natural Gas in the region. 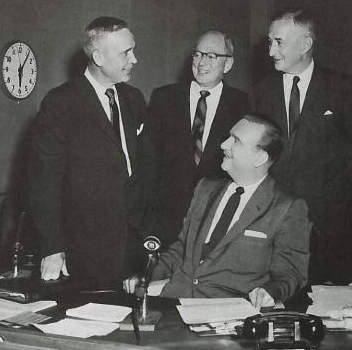 L-R: Gwilyn Price, chairman of Westinghouse, Roger Bolin, advertising director of Westinghouse, Walter Cronkite (seated), and George Ketchum circa 1952. Senior partner and chairman Ray Kotcher recalled some of the firm's most memorable assignments, including feeding Stouffers products to the Apollo 11 crew, developing and coordinating the Atlanta Olympic Games Torch Relay, helping Doritos pioneer consumer-generated Super Bowl advertising, and promoting IBM's centennial. "With some of the longest-standing relationships in the communications industry, our clients have placed their trust in us to help them advance their brands and build their reputations," he said. In addition to the pro bono service, the firm will also be paying for 90 young women in Tanzania and India to complete secondary school through a partnership with Room to Read. 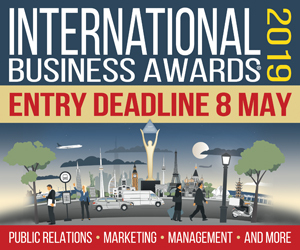 Groups taking part in its pro bono offering include the Leukemia & Lymphoma Society and Habitat for Humanity (New York), Born in Africa (Belgium), the Turkish Diabetes Foundation and Diakonie Jugendbilfe Oberbayern (Germany). "To keep our focus on the future, we will be celebrating our anniversary by improving the lives of those less fortunate," said senior partner and CEO Rob Flaherty. Ketchum was acquired by Omnicom in 1996. It has 130 offices around the globe. The firm is plannning anniversary events in New York and Cannes in June, as well as a global virtual staff meeting. George Ketchum died in 1975 at 82. By the late 1970s, Ketchum's revenue surpassed $4M and it dropped the KM&G name in favor of Ketchum Communications in 1981. Its first global account was FedEx in 1994. Whirlpool was its first assignment across Europe.